Although the weather doesn’t always reflect the season we’re in, autumn is, in fact, upon us. This cherished season is associated with everything from cozy sweaters to corn mazes to hayrides. But cooler weather also has its downsides, namely ushering in the dreaded cold and flu season. As people spend more time indoors together, germs spread more quickly — threatening the health of your immune system. Incorporating these nutrient-dense, immune-boosting superfoods into your diet may help prevent the sniffles and keep you feeling great all season long. Spices and herbs are known for their flavorful properties, but most of them are also packed with vital nutrients. Turmeric in particular is known for its high concentration of antioxidants — substances that protect your body’s cells from the damage caused by free radicals. The vibrant yellow spice is also known for anti-inflammatory properties that make it ideal for fighting colds, coughs, congestion, and related symptoms. Turmeric is a popular seasoning in Asian cuisines, where it is used as a meat rub and in traditional dishes like curry, but it can also be added to beverages, too. A turmeric latte, otherwise known as golden milk, is a tasty treat packed with spices like cinnamon and cardamom and a touch of honey for natural sweetness. Much like turmeric, omega-3 fatty acids, which can be found in fish like salmon, tuna, and mackerel, contain healing anti-inflammatory properties that are ideal for combatting the common cold. Reducing inflammation is key, as it impedes your immune system’s ability to work properly. 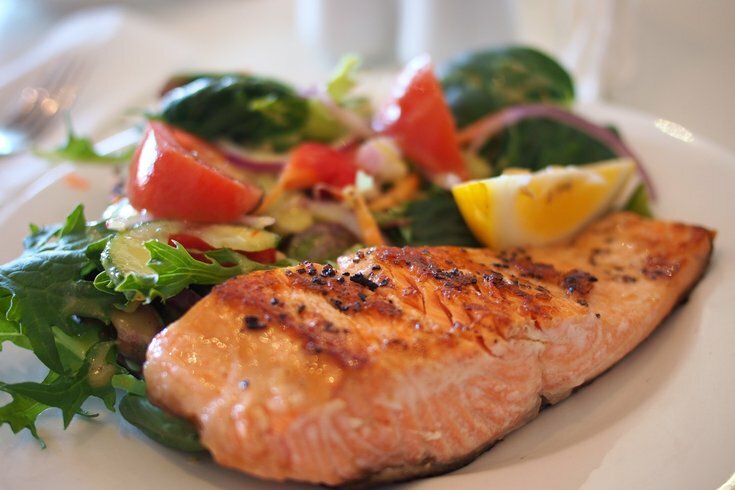 When incorporated as a regular part of your diet, fish packed with healthy fats will help cut down on chronic inflammation, which is especially important when you’re feeling under the weather. Chicken soup is renowned as a classic cure-all, and for good reason: According to the Academy of Nutrition and Dietetics, chicken soup helps to prevent inflammatory white cells from moving to other parts of your body, which can alleviate your cold symptoms. Soup also helps keep you hydrated, and the heat can help break up secretions and congestion. Hearty chicken soups are comprised of bone broth, which contains lots of collagen and various amino acids. These elements help bolster your immune system and decrease inflammation. If you’re a fan of Italian cooking, you likely have a clove or two of garlic hidden away in your pantry. This is good news for cold sufferers, because garlic is full of health benefits that can help you kick those germs to the curb. Garlic contains allicin, a sulfuric compound that fights bacteria and infection. While it is safe to eat raw, prepare yourself for a burst of pungent flavor — and some killer bad breath. Luckily, garlic can be easily simmered and added to a number of meals, from pastas and veggie dishes, to cold-slaying chicken soup. Your immune system relies on vitamins and minerals to function correctly, and it’s no surprise that fresh produce contains a significant amount of both of these things. Vitamins C and E are particularly helpful when it comes to bolstering your immune system. Leafy greens like kale and spinach, carrots, sweet potatoes, and bell peppers are exceptionally high in vitamin A. For your vitamin C fix, it’s all about the citrus, but other foods contain a high volume of this vitamin, too. Strawberries, mango, broccoli, and tomatoes are bursting with flavor and the vitamin C you need to stay cold-free. Avocado and butternut squash are both excellent sources of vitamin E, and they make for tasty additions to salads and sandwiches. Consuming healthy superfoods at the first sign of a runny nose may help reduce the duration of your cold and get you back to feeling your best. Work these superfoods into your regular diet and your body will thank you.